At the beginning of 20th century, Giuseppe Toscanini starts a timber business in Isolella Valsesia, in the Piedmont region. With his father’s wood, son Giovanni produces knives branded with the family name, sells them to the market and in 1920 founds the company that takes his name. The change from the artisanal to the industrial process only happens after World War II, when Ettore takes over the company: an energetic and creative person, he designs everything from chopping boards to beach chairs. His flagship products are the clothes hangers he sells to department stores like La Rinascente, Standa and Upim. The market grows and he signs the first commercial agreements in the United States. In the 70s, during the hippie fashion, he patents wood and cork clogs for men and women, producing five hundred thousand pairs a year. Under his direction everyday objects become small sculptures and attract the fashion industry: Valentino is the first to commission a tailor-made hanger as a gift for his customers. In the mid-1990s, Federica, Cristina and Giovanni enter the company. 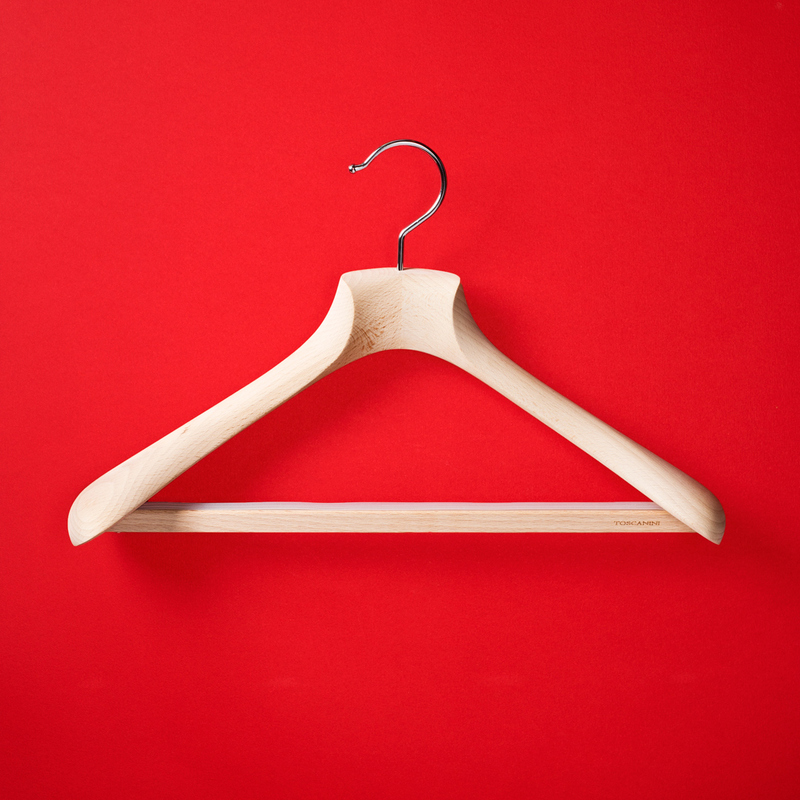 These are the years of the uprising single brand stores and the clothes hangers are an important accessory to build the brand image: Armani chooses lacquered black, Bottega Veneta wants wengé, Loro Piana goes for natural beech. The Toscaninis accept new challenges, like Chanel's desire to hide the hangers to maximize the clothes' perfection, to which they respond by molding a transparent material, plexiglass, to build a precious and essential “non-structure”. Today, the company is increasingly involved in the fashion world, without forgetting its DNA. This is why it has just launched a bespoke collection for men, women and children. A small luxury to safeguard carefully in the closet.